Do not use the hook to tow the vehicle. Remove the cover bumper bracket using a flat screwdriver or any flat tool. 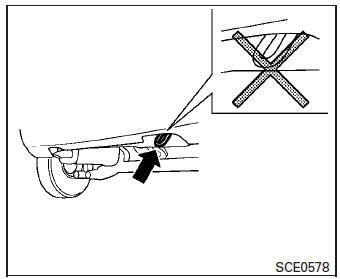 To protect the bumper body, place a piece of cloth between the tool and the vehicle. The tool used should be inserted by the lower portion of the cover. 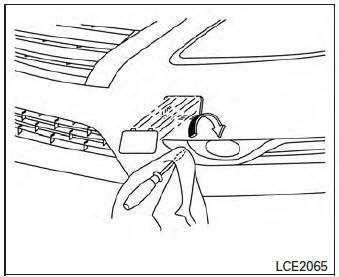 To remove the cover it is necessary to rotate the flat tool, as shown in the image, in order to avoid any damage to the body. 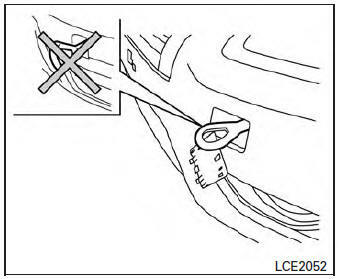 Do not use the tie-down hooks for towing or vehicle recovery. Turn off the Vehicle Dynamic Control System. Shift back and forth between R (Reverse) and D (Drive) (CVT models) or 1st (Low) and R (Reverse) (M/T models). Release the accelerator pedal before shifting between R (Reverse) and D (Drive) (CVT models) or 1st (Low) and R (Reverse) (M/T models). Do not spin the tires above 35 MPH (55 km/h).